Neste mês, na minha coluna da Happi Magazine (revista americana especializada no mercado cosmético) falo sobre os hábitos de cuidados anti-idade das mulheres brasileiras e de algumas latino-americanas: What’s Driving Latin America’s Anti-Aging Market? Demand for anti-aging products is strong the world over, but gains are particularly buoyant in Latin America. 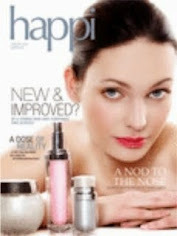 According to Euromonitor International, global anti-aging product sales grew 44.5% during the past five years (2007-2012). Sales in China and the US, which hold the top spots, grew 162% and 36.4%, respectively in this period. But the gains in Latin America were nearly as impressive. For example, sales in Brazil, which is the biggest market in the region and the seven in the world, rose 45.1% during the five-year period and Mexico, the No. 2 anti-aging market in Latin America, posted a 50% gain in sales. What´s driving the Latin American anti-aging market? It’s the emerging middle class in Brazil that has contributed a lot due to these consumers widespread use of aesthetic treatments, according to Dr. Carolina Assed, dermatologist and researcher of Brazilian Society of Dermatology. In addition, Brazil is dominated by a cult of beauty, which demands these kinds of investments, as well as the fact that it is a tropical country with many beaches, which affords plenty of opportunity for women to bare their skin. Dr. Tatiana Jerez, dermatologist and a member of Brazilian Society of Dermatology, noted that more and more young women are seeking anti-aging treatments preventively, which is really ideal. The concern with aging comes early, often before a woman reaches her 30s. Brazilian women in general prefer products with a light texture that won’t leave the skin sticky. They also want products that have several functions, such as moisturizer with sunscreen facilitating their daily use. Regarding active ingredients, retinoic acid is the No. 1 treatment, followed by alpha hydroxy acids such as glycolic acid, which has anti-aging and lightening properties. In fact, glycolic acid peels in a concentration of 30-70% are also widely used. Brazilians are well aware that ample use of sunscreen helps prevent age spots, premature aging and skin cancer. Still, whitening treatments including formulas with hydroquinone, azelaic acid, kojic acid, vitamin C and glycolic acid, are very popular. According to these doctors, the most common aesthetic procedures in Brazil are botulinum toxin, hyaluronic acid filling and superficial peels. The toxin quickly improves the appearance of wrinkles without impacting the patient’s daily activities; hyaluronic acid treatments usually present no adverse reaction, stimulate collagen and attenuate grooves; superficial peels renew the skin and soften fine wrinkles with little or no downtime.